You may use our space ship or alien animations on your personal and educational web pages. This page has a variety of aliens including one of our favorites the two little guys that are using the Martian Rover as means of transportation for their vacation trip. 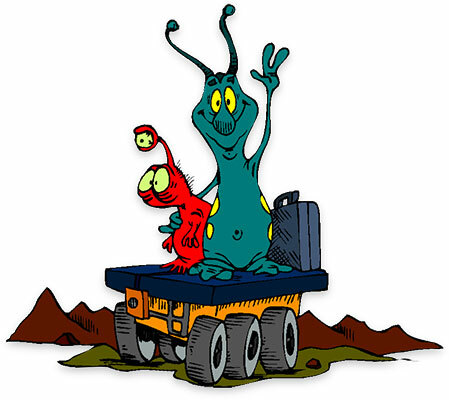 Two Martian friends use the Rover as a taxi. Green space alien with big red eyes. 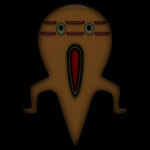 This alien was created for use on black or dark backgrounds. Copper alien with green eyes. He seems angry and determined. This graphic was designed for dark and black web pages. Big nose, funny clothes and a lump in this aliens throat. Graphic has a white BG. Blue alien animation with large black eyes. This space man is designed for white or light colored pages. Space ship creating its own gravity! Animation has a transparent BG. Animated blue space alien that swings from side to side. Alien designed for black or dark pages.